Here’s today’s Inktober and this might be my favorite one this year. 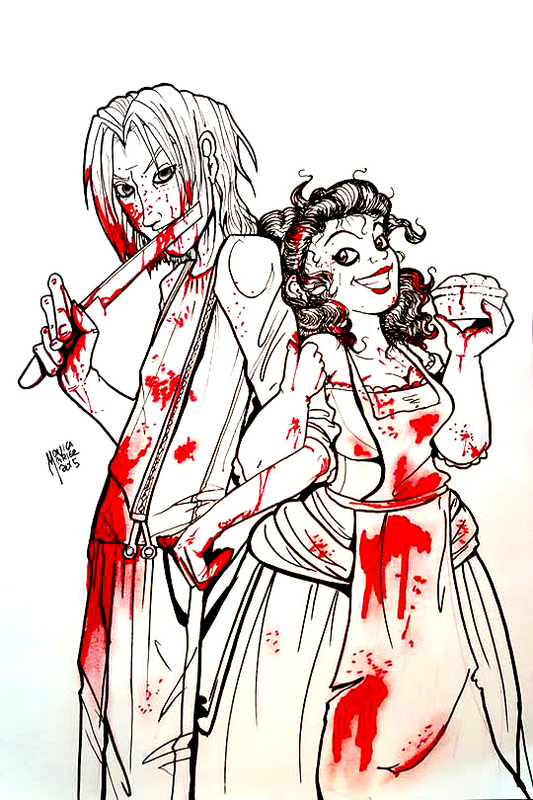 I’m watching Sweeney Todd for Carpe Scream and I started thinking about a picture of Sweeney Todd I’d drawn when I was in college (about 1999). I’d never SEEN Sweeney Todd, I only had the soundtrack, so in my head I had to imagine what everyone looked like. In my head, Sweeney was thin as a rail and blond. Everyone was like “what?” but I thought it was cool. Anyways, here’s an updated pic of both Sweeney and Mrs. Lovett. It was done with Faber-Castell pen and a Crayola red washable marker.